This photo was posted on Facebook, but for those of you who don’t FB here is the photo of the Prayer Quilt. 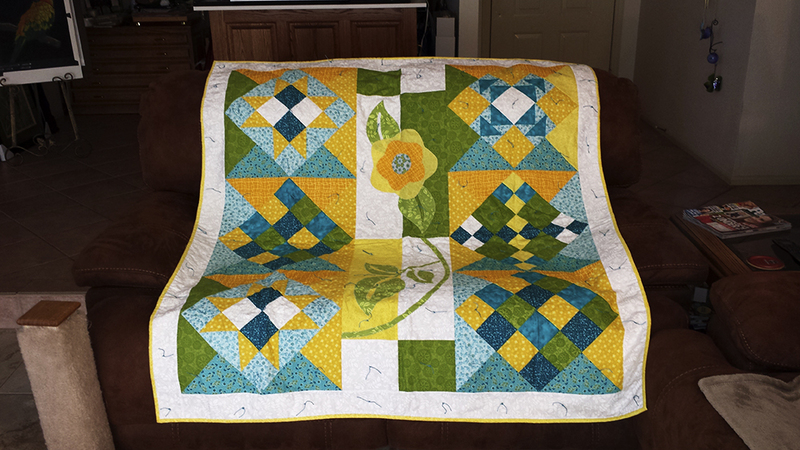 It was done by the wonderful Prayers and Squares Quilt Ministry at the Houston Salvation Army. Each knot represents a prayer said for me. It brought tears to my eyes and joy to my heart. Thanks to all of you for the prayers and what a beautiful reminder of prayers said! SO this week brings a new result of side effects. I don’t know if I have mentioned it before, but mouth sores are one of the side effects of the chemo. Well, I sidestepped the mouth sores, but have nose sores. The nurses said to use vaseline to keep them soft and not bleeding. So I have used vaseline and Saline Nasal Gel, which work; however, in the last couple of weeks, I have lost a lot of the sensation in my nose……..resulting in random “nose drip”. LOL, who ever thought I would be a snotty nosed ole lady?!?? Now in addition to checking me for charcoal, paint, and/or bird poop, before I leave the house, my family has to tell me to wipe my nose. This has been a good resting week, the nausea has not been as bad, and shock, I gained a couple of pounds this week. Guess, I will have to cut back on the hot fudge sundaes! Here are a couple of photos on the progress on Charlie. The one in the middle was taken indoors in warm lighting, and the other one was taken outside in the shade and is closer to the real color of the drawing. Well, better go take a nap and get ready for chemo next week……where are my therapy kitties?!?!!? Why the bed is not made! Happy New year to all of you! Wishing you a great year full of all the people and critters you love. As you can see the cats are going to start the new year as usual and I won’t be making the bed. 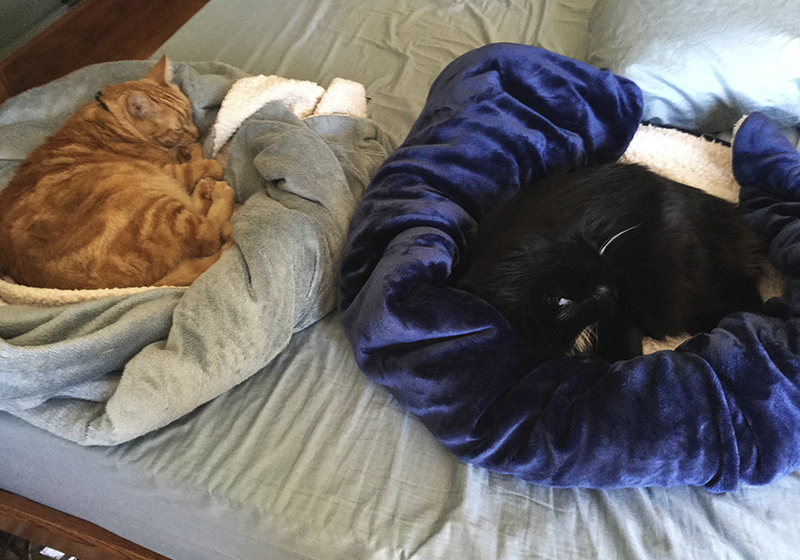 Hubby gets up early(5 ish) makes kitty breakfast, then rolls up two blankets into kitty beds. When I wake up …..yes, considerably later, this is the scene. These guys stay there all day until dinner time, then come out and stare us down until someone produces the gourmet meal. If you don’t have a cat, you cannot truly appreciate the power of a kitty “stare”. Meanwhile back at the ranch….after the kitty breakfast is prepared, the birds start screaming for their gourmet breakfast. Once that is done and served….blessed quiet, while the parrots eat, throw food and start planning the day’s chaos. This has been a good resting week. I am really having to rest after chemo week and Christmas coinciding. Even though it was quiet compared to a normal Christmas, we still were surrounded by loved ones. SO here is the result of this week’s art therapy. 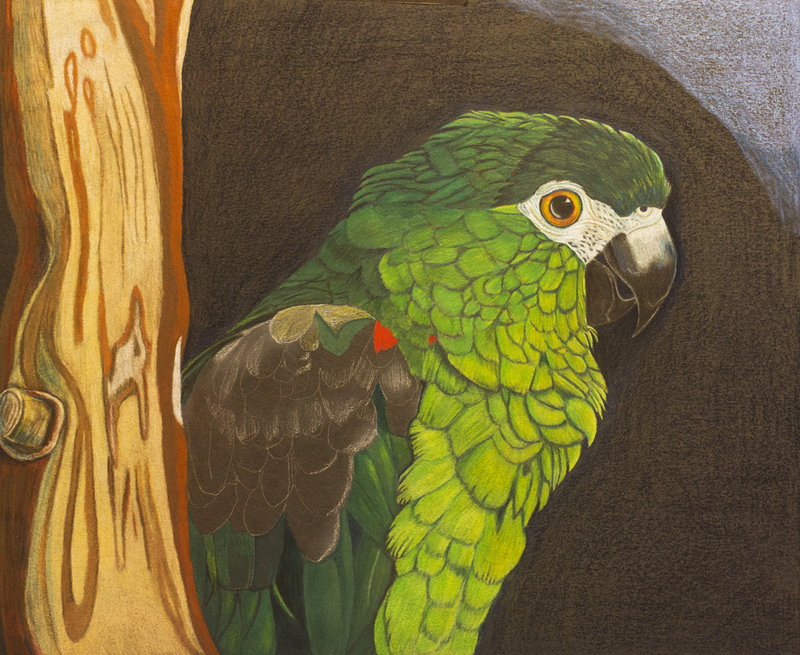 I started a colored pencil on the mixed media paper – of Charlie. My little Hahn’s Macaw is known affectionately to the rest of the family as Hannibal the Cannibal. I don’t know where they get such a name!?!?!? Charlie is very affectionate with me, but from the blood evidence on the members of my family who dare to try to handle Charlie, maybe the name fits her? All I know is she is a little bundle of feathered joy to me. Charlie and Sunny have been the excuse for many an art store binge, after they have run down my arm and chewed up brushes and pencils. Like I really need an excuse to go to the art store, LOL. Once again, as I look back over this year, I am Thankful for all of your prayers, good wishes, and positive thoughts. This year, together, we will continue to STOMP on cancer and win this war. 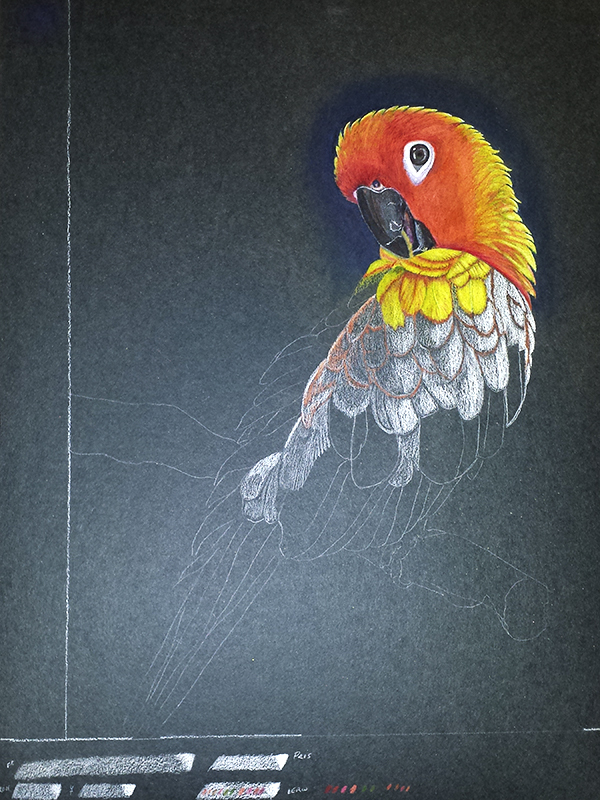 Half Way, Hats, and Sun Conures. Just another day in Chemo. 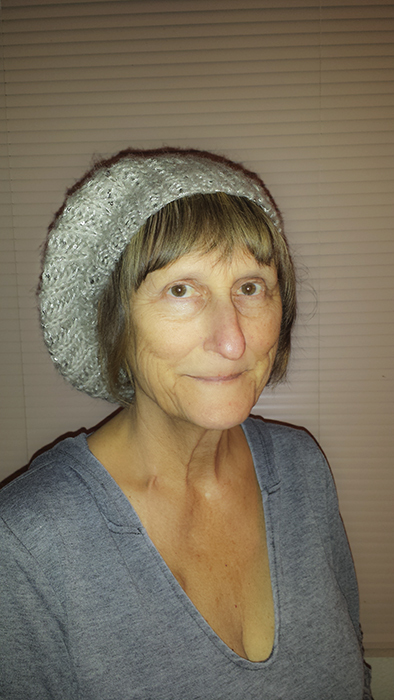 Six chemo treatments down, six to go! Whooo Hoooo…halfway through the war. One battle at a time. Here is a picture of my husband, George, who has been there every step of the way. 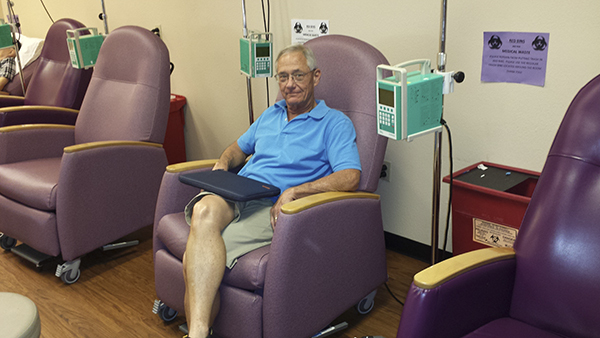 He is modeling the chemo treatment chair. They give us a pillow, a warm blanket and life saving drugs. (Even though you feel crappy or sleep for the next week, LOL.) They are warm, caring, helpful, and good listeners. I am so Thankful for my medical team! needles to see if they are going to have to shave their heads. 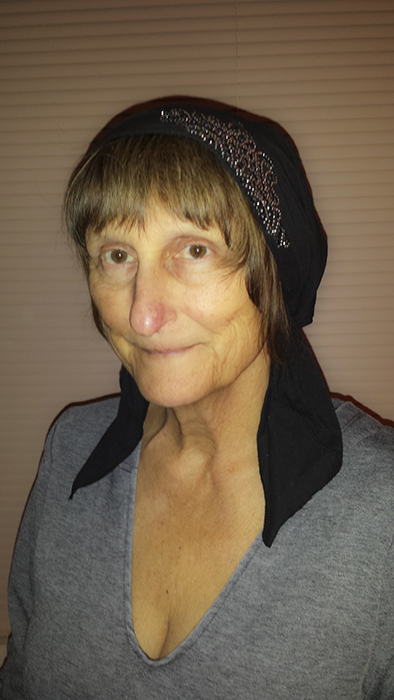 Maybe I can glue the bangs on my head……wait…..maybe I should save all the hair when it falls out, and I can attach it to one of the hats, LOL! Ok this is enough of the hats, I will post some more of them next time. how the color shows on the white. 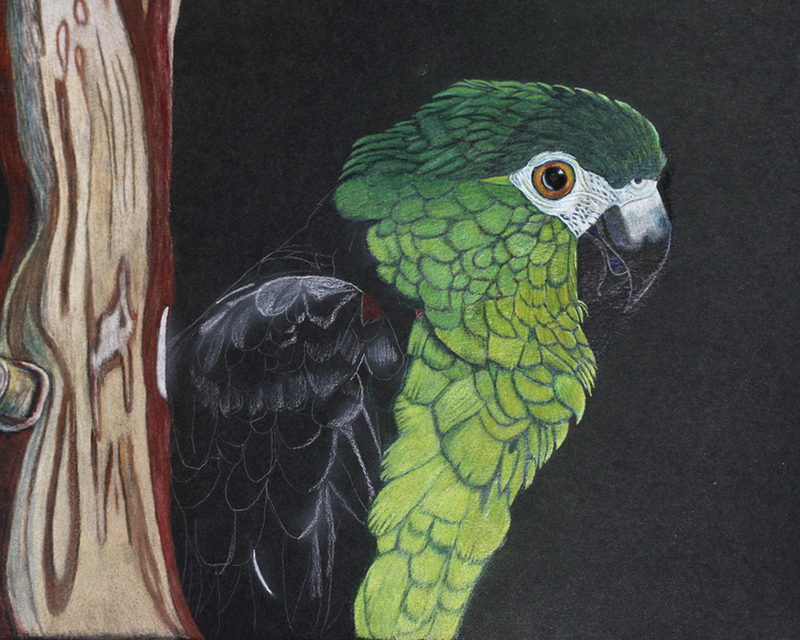 Colored pencil work is very time consuming and must not be rushed. It takes many layers to fully cover the paper and give it a finished look. Caution, these are not your mama’s colored pencils, LOL! 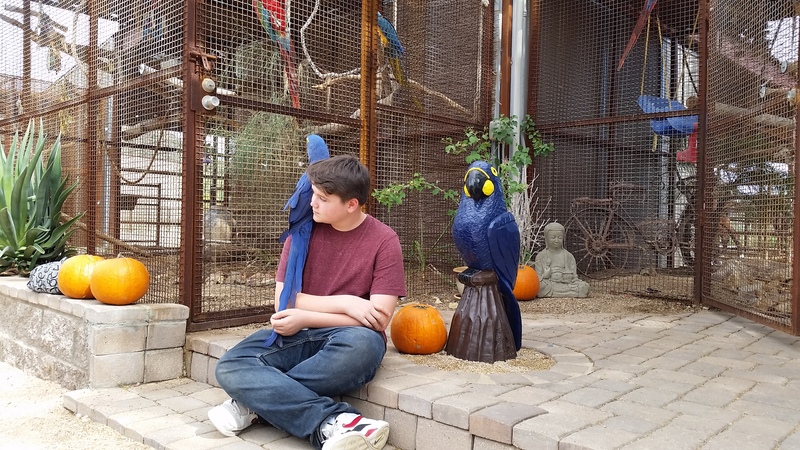 During my rest week, we were invited to a Hyacinth Macaw Party. Usually I don’t get out a lot, but this party Mici put on, was not to be missed! Most of my bird friends were attending, so I rested all week to be able to go for a while. 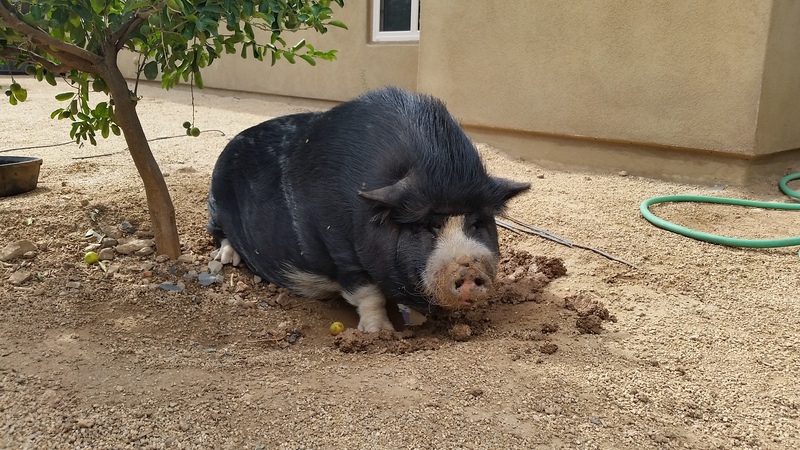 Mici’s place is beyond amazing, we got the tour of the rescue horses, birds, goats and who could call the visit complete without the “Watch Pig”. Joey the celebrity bird, with his friend, Paco, crashed the party…..they are not hyacinths, but they do have some blue on them, so guess that counts. 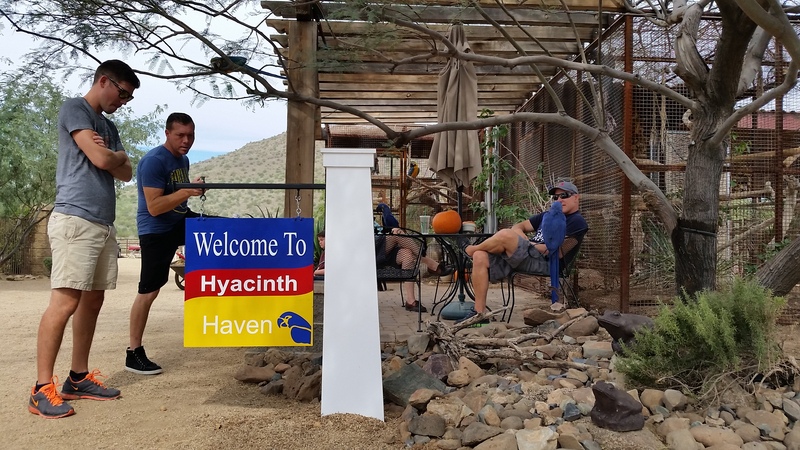 Everyone had a wonderful time, got plenty of visiting time with the hyacinths, lots of scritching, kissing and cooing going on…..then we were treated to one of Mici’s “snacks only” spreads. all I can say is if I need to gain weight, I know where to go. Noelle was still in a cannoli coma the last I heard. Lori lost her son to all the activity for a while, last I heard he was full and tired out. Well even though I rested all week, only made it about an hour before fatigue set in, but it is an experience I will never forget. Mici and Fred are amazing, compassionate people, it is an honor to know them. My phone decided to do a fitware update on my camera while we there, so I did not get any photos, luckily hubby took the ones here. THREE DOWN AND NINE TO GO! Made it through another chemo week, slept until Friday afternoon and am awake and back to my new “normal”! Had a visit with the PA on Friday, and we are scheduling a petscan right after treatment six, to see how things are going and how well the chemo treatments are working. SO the fight goes on! My family is sure the chemo is helping. They see an improvement in my pain levels and energy levels, so I am sure we are winning the war. Keep those prayers, positive thoughts and well wishes going! Thanks so much! Another Time Out For Commercial Break! Hurry! only two weeks left to support these wonderful projects! If you are attending the AFA Conference, hopefully you can meet Barbara and Blu Lu along with Mary Rose of Chirping Central. Please stop in, say HI!, and buy LOTS of tickets! Now back to your regularly scheduled program! Do Birds have a sense of humor? 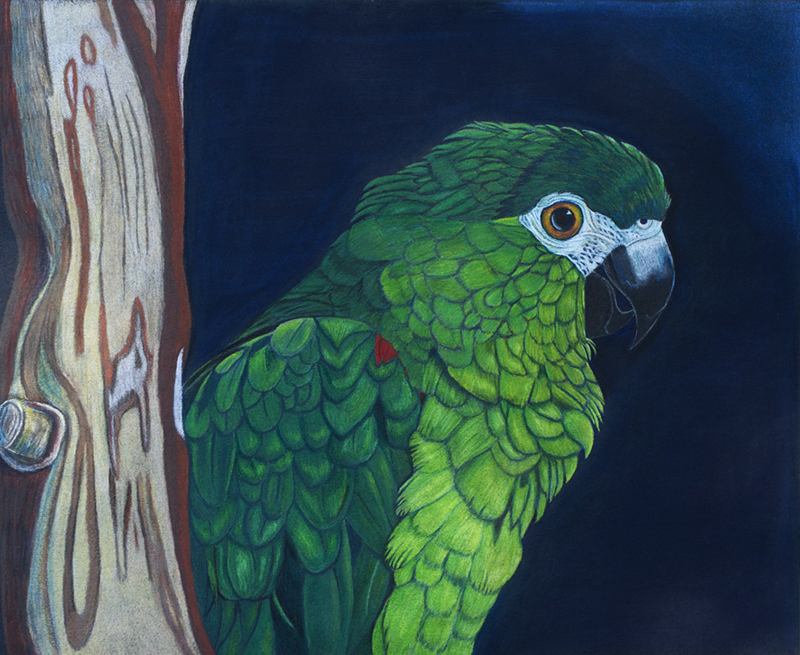 As an artist, many of my works have been donated to organizations who support bird and wildlife conservation, rehabilitation, education, preservation and research, especially for endangered species. Many of these organizations study bird behavior, but with an emphasis on scientific studies. For example, Irene Pepperberg at the Alex Foundation has spent her career proving to the scientific world what Parrot owners know – that birds are intelligent and cognizant. Studies are being done on bird behavior, diet, procreation, and even on how their wings get their colors……..however as a parrot owner I am interested in exploring my birds sense of humor. Hopefully some day science will prove that birds have a sense of humor. But…….. anyone who works with ravens, crows or parrots already know the answer to this question, it just remains to be proven scientifically. Not being a scientist though, just an eclectic artist/ bird lover I would like to put it on the record – they DEFINITELY do have a sense of humor. Looking back through Indian Lore, you will find that brother Raven is well known for his sense of humor, European folklore has ravens and crows pop up with a definite sense of humor many times with a cruel streak, and parrot owner can cite anecdote after anecdote proving their birds play tricks on each other and humans, and laugh about them. So adding another one to the pile, even though it is not scientific, I observed this incident myself, and leave you to judge for yourself. So it does sound kind of like a zoo around here with two macaws, two conures and a parrotlet, however on the day in question, Sunny was screaming more and louder than usual. Then I head the Hahn’s Macaw, Charlie laughing. It is not unusual to hear Charlie or Loki(Blue and Gold Macaw) laughing. However, Sunny’s raucous screaming, stopped, then started again, followed by Charlie’s laugh. This managed to break my preoccupation, so I decided to sneak a peek in the other room to see what was going on. Sunny was quiet and was on the opposite side of the bird perch from Charlie, so I almost walked away, then it happened…….Charlie went to Sunny’s side of the perch and pecked Sunny’s foot. Sunny started screaming at Charlie, who ran to the other side of the perch, laughing all the way. I stood there with my jaw dropped to the floor, absolutely stunned, and it happened again. By this time laughter started to explode out of my mouth, and Charlie did his little trick again making the mad dash to the other side of the perch laughing all the way. Feeling sorry for Sunny, I took her off the perch and let her stay on my shoulder, however, I still smile thinking of Charlie teasing Sunny just like a little brother. The parrots all must be laughing at me…….I get up every day and make them a yummy breakfast, clean after them, am a walking talking jungle gym for them, and feed them a nice yummy snack before bed time, go through an elaborate ritual every night putting them to bed, WHO are the smart ones here??????? ?